Everything in Georgia speaks about its greatness and wealth. Numerous monuments - cult structures of the early Christianity, ancient churches and monasteries hiding in the Caucasian Mountains are silent witnesses to its rich history. The generosity of the inhabitants of Georgia has become in best expressed by the saying “the Georgian hospitality” which implies a noisy cheerful feast with endless toasts and rivers of magnificent Georgian wines. Everything in Georgia is unique, original and exotic indeed. It is the country of highly developed culture which evolved like a colorful mosaic for centuries. Tbilisi –Manglisi –Tabatskuri - Bakuriani (200km. duration 5-6 h) Tbilisi is the capital and the largest city of Georgia, located on the both banks of the Mtkvari river, founded in 5th century by King Vakhtang Gorgasali. Sightseeing of the ancient, historical part of the city. Drive to Manglisi – due to its geographical conditions and climate Manglisi is one of the favorite town resorts in Georgia. (picnic-lunch closed to the reservoir wich is 34 km length). 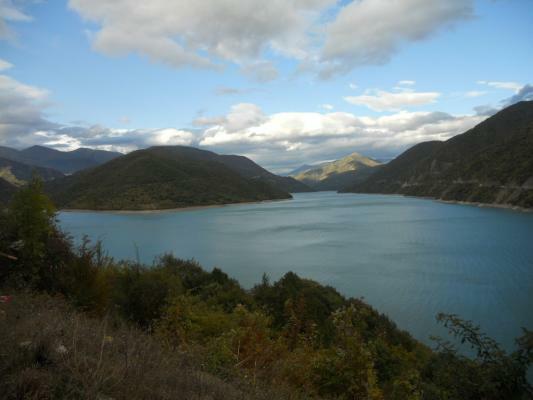 Drive to Tabatskuri –is volcanic lake. Drive to Bakuriani - is a popular skiing resort, located on the northern slope of the Trialeti Range, at an elevation of 1,700 meters above sea level. Overnight in Bakuriani. Bakuriani-Khertvisi-Vardzia - Akhaltsikhe (200km. duration 5-7 h) Drive to Vardzia. Cave town Vardzia (XII century) is one of the most important and impressive historic monuments in Georgia. Vardzia is located at the altitude of 1300 meters above sea level. On the way back visit Khertvisi fotress – one of the oldest fortresses in Georgia and was functional throughout the Georgian feudal period. Drive to Akhaltsikhe – historical town of Georgia. (possible to visit Synagogue). Overnight in Akhaltsikhe. Abastumani-Zekari-Sairme-Kutaisi (150km. duration 5-7 h). Abastumani is a townlet and climatic spa, located on the southern slopes of the Meskheti Range in the small river valley of Otskhe. In Abastumani was founded Georgian National Astrophysical Observatory. Continue the way passing Zekari pass. Drive to the one of the beautiful resort in Georgia - Sairme, passing Zekari pass. Drive to Kutaisi - the second largest city of Georgia, located along both banks of the Rioni River. Kuataisi was the capital of the ancient Kingdom of Colchis. Akhaltsikhe-Borjomi—Kutaisi Drive to Borjomi - is a resort town in south-central Georgia. The town is famous for its mineral water industry (which is presently the number one export of Georgia) Visit Borjomi Park. Mineral water tasting. Continue the way to Kuatisi. Overnight in Kutaisi. Kutaisi-Zugdidi- Enguri Gorge –Mestia (250km. duration 5-8 h). Visit Sataplia Nature Reserve (cave of stalagmites and stalactites and also you can see Dinosaur’s footprints). Drive to Svaneti, passing Zugdidi - is a city in the Western Georgian historical province of Samegrelo. Visit Dadiani Palace, belonging to the former dukes of Samegrelo. Today more than 50 000 rare exhibits are on display at the museum. Among its collection of relics of European monarchs and imperial families there is a death mask of Napoleon Bonaparte. The museum also houses the relics of Christian saints. Drive to Mestia - the main regional center of Upper Svaneti. Svaneti is a historic province in Georgia, in the northwestern part of the country. It is inhabited by the Svans, an ethnic subgroup of the Georgians. Surrounded by 3,000–5,000 meter peaks, Svaneti is the highest inhabited area in the Caucasus.Svan fortress, wich at the same time served as residences, are very interesting to see. In the event of an attack they were used to protect their inhabitants. Overnight in Mestia. Mestia – Ushguli – Tkhenitskali Gorge – Lentekhi – Kutaisi (250 km) Drive to Ushguli - one of the highest villages located at the head of the Enguri Gorge ( 2200 m above the sea level). It is possible to see one of the most favorite Caucasian picks for mountain climbers - Ushba (4700 m), Shkara (5050 m) and Tetnuldi (4852 m). Continue the way to the Svaneti range pass (2623m), then passing Tskhenistskali Gorge we arrive to Kutaisi. Overnight in Kutaisi. Kutaisi-Gori – Uplistsikhe – Ananuri - Geregti Trinity Church - Dariali Gorge – Gudauri (350 km. duration 5-7 h)Drive to Gori. The city was founded by one of the greatest kings of Georgia – David the Buider (1089-1125). Gori is also known as the birthplace of the Soviet leader Joseph Stalin. Visit Joseph Stalin state museum. Drive to Uplistsikhe (literally, “the lord's fortress”) is an ancient rock-hewn in eastern Georgia. Built on a high rocky left bank of the Mtkvari River, it contains various structures dating from the Early Iron Ages to the Late Middle Ages, and is notable for the unique combination of various styles of rock-cut cultures from Anatolia and Iran as well as the co-existence of pagan and Christian architecture. Drive to kazbegi. On the way visit Ananuri (17th century) is a castle complex on the Aragvi River. Drive to Gudauri. Tour along hiostorical Georgian Military Road. Gudauri - is a ski resort (2000 meters above the sea level) located on the southern slopes of The greater Caucasus Mountain Range in Georgia. Continue the way to kazbegi by crossing the “Jvari Pass” (2379 m. above the sea level) . Explore the area – the beautifully situated on the hill. Drive to Gergeti Holy Trinity Church is a remarkable monument of Georgian architecture, near the village of Gergeti, situated at an elevation of 2170 meters, under Mount Kazbegi (elevation 5033) and continue the way to Darial Gorge. Overnight in Gudauri or in Kazbegi. Gudauri – Mtskheta - Tbilisi (200 km)Drive to Mtskheta - one of the oldest cities of the country of Georgia, was capital of the early Georgian kingdom of Iberia during the 3rd century BC - 5th century AD and it was the site of early Christian activity. Visit Svetitskhoveli Cathedral (11th century) and Jvari Monastery (6th century) in Mtskheta are among the most significant monuments of Georgia architecture, and are historically significant in the development of medieval architecture throughout the Caucasus. Back to Tbilisi to walk the beautiful Tbilisi streets. Farewell Dinner at the national restaurant in Tbilisi Transfer to airport.